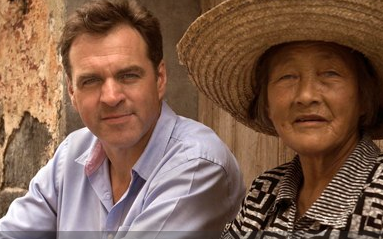 Niall Ferguson’s one hour history and sketch of China started with him admitting that he didn’t really understand it – in fact he feels like he is an alien when he visits. Not a promising introduction, but he soon starts giving the lie to it by pointing out some of those obvious facts that stare you in the face but that you never really notice. For a start, what is China’s biggest problem? Well what is likely to be the problem of the biggest state on the planet? How do you hold together a fifth of the world’s population? As Ferguson points out, this is bigger than the combined population of northern America, Europe and the former Soviet Union. How would a state like that hold together? As Yugoslavia shows, even much smaller entities cope badly with ethnic differences. China has over 50 to cope with. Looking at history, it is not too hard to see that the Chinese have often failed to hang together. And when it does work it only works thanks to a firm autocratic hand at the centre. Today’s Communist Party politbureau behaves in basically the same way that the first emperor did 2,300 years ago. In fact much that he did was still in place until the last century, and some things such as the script is still used today. With the long history of autocratic rule, and even more the periods of chaos when there was no autocratic rule, the Chinese have become accustomed to live with order trumping freedom. Ferguson looks around an large Bejing bookshop, and finds that there are no biographies of the likely next leader of China. Confucian philosophy emphasises harmony rather than individualism. Harmony is used as a code word for what in the West we would regard as repression. Dissidents joke that they aren’t censored, they are harmonised. The Chinese civil service required the applicant for admission had to write what is known as the eight legged essay. What is an eight legged essay? Ferguson struggles to understand it. If someone who has written as much as him can’t get his brain around it, I don’t suppose the rest of us have much chance. The exams don’t exist any more but the Communist Party now runs the world’s biggest bureaucracy. It stretches out from some anonymous buildings in the capital right down to the local party officials in the villages. They keep the population under very effective control. Are the Chinese yearning for western style democracy? Ferguson cannot find out because the party officials don’t let him speak freely to them. But the lack of democracy has some serious downsides. The one that bothers Ferguson, an economic historian most, is corruption. Corruption is never far from any autocratic government. There was plenty of it in imperial China. One of the many continuities between the emperors and the communists is that same corruption. Without a free press and a political opposition, there is not much to stop it. The Chinese official press itself estimates that 123 billion dollars have been transferred out of the country to the bank accounts of ‘missing’ executives and apparatchiks. Corrupt bureaucrats are executed, but that doesn’t seem to stop it. The corruption is on a such a scale that it might be enough to cause serious social unrest. Again, there is plenty of historical precedent. Turmoil was a common and could be enormously bloody. The Tai Pen rebellion cost some 60 million years, led by someone who was under the impression that he was the brother of Jesus Christ. In most of the twentieth century things weren’t much better, with civil war and invasion by the Japanese costing nearly as many lives. It does make you understand why human rights are not as precious while order is, in a population of 1.3 billion people who have to be stopped from killing each other. All in all, this programme was classic Ferguson. Easy to watch, easy to follow and thought provoking. He tells a good story. If it weren’t for the sneaking suspicion that he has oversimplified some points in favour of making the narrative compelling and to fit in some of the more interesting footage, it would be impossible not to recommend it. But despite that, I wouldn’t want to miss it. And quite a lot more if you click on the Niall Ferguson tag. Previous PostBlack Swan by Nassim TalebNext PostWhat Is Really Going On in the Primaries? bellions, which he confuses). But oversimplification in a one hour TV programme dealing with over 2000 years of Chinese history. Ferguson's forte is the “big picture” which he presents with his characteristic panache. One significant lacuna was the lack of reference to the importance of the forces of repression in the PRC: the PLA and the PSB, on which CCP power depends. Another was Mao Zedong, the supreme example of a “new emperor”. Today's governing elite is of a different stamp, eschewing charismatic autocracy and favouring impersonal, collective rule. Perhaps these matters will be dealt with in the next two programmes. Yes absolutely. In fact I turned on, picked up my laptop and started typing without realising it was the first of a series of three, so I hope the next two have a bit more depth. I thought it was an interesting programme and Ferguson does point out some good point as to why China's economy is booming whilst the rest of the world's stagnates. The point of the collective harmony and everyone knowing where their position is in society and what their place in the work force is shows how the Chinese tradition of Confucian thinking helps keep their economy rolling. It is hard as a westerner to understand (as Ferguson says)how a society can function without the right to chose and know who govern them. However it seems that this form of government and rule seems to be working as China is becoming an economic power, with their ability to move towards a capitalist economy but still keeping the Chinese traditions of an autocratic society. I became annoyed with the program in about 15 minutes into the program. How a man who is not specialist is making a programme on Chinese history is beyond me. It is oversimplified in stating that China is autocratic and has ever been autocratic without ever going into detail with what 'autocratic' means. You can easily say China is autocratic when you look at it from an elite political level but when you going into the localities, throughout eras like the Qing, Nationalist, CCP era they had to work with the local elites the magistrates and cadres which continues today. It is not 9 men who control China, they are subject to as much factionalism as Mao was when it is wrongly assumed that he held all the power in China. I know it is only a 1 hour tv program but to make general assumptions on controversial points of history is ridiculous. I think it is easy to criticise the Ferguson approach. For a start he does come at the subject matter from his own particular right wing perspective. This certainly isn't to my taste and I think he does twist the facts to match the line a bit. Leaving out the Opium War for example – assuming it doesn't come up in the next two shows in the series – does ignore one of the big factors in creating modern China. But in his defence this is a popular TV programme on a subject that few people know much at all about, and he did make it interesting and watchable and it was accurate enough to leave someone who previously knew almost nothing about China better informed than before they watched. That might seem a low bar, but how much else that even does that is in the TV schedules nowadays? There's all kinds of bad history on display here. Let's start with the “China doesn't hold together unless it's autocratic”: who says that China, as currently constituted, is a naturally cohesive unit that belongs together? Or that the various previous incarnations of the Chinese empire — and it's an empire because it involves conquering territories that aren't naturally cohesive — represent some kind of platonic ideal of a nation that necessarily should be unified. It's like saying that European Union was the natural outgrowth of the Napoleonic and Nazi empires, but the EU isn't really strong enough to hold it together…. Eight-legged essays aren't that hard, any more than the 5-paragraph theme is hard. But getting a good explanation isn't easy. As a Chinese person (lived in China in teen years, came to UK in mid 70s, post Cultural Revolution) living in the UK, reading and trying to understand history of my former country is a hobby. I enjoy seeing the scenery in HD TV of many parts of China which I have not visited. But sadly I find Niall Ferguson program very disappointing. Instead of saying this surprising or that unbelievable he should do more home work before making the program. Putting everything down to the ‘big air brush’ or ‘party machinery’ is easy and convenient. That is a good point. I think Ferguson's work suffers from his huge output. He might do better to focus a bit more. The programme (first two parts so far) presents a biased view. Ferguson states on numerous occasions that China airbrushes some of its history. However it made no attempt to mention Britain's involvement in China in the 1840s, namely the two opium wars, where Britain shipped large quantities of opium into China and effectively poisoned the Chinese. Neither was the Allied Nations addressed, when eight countries, Britain, US, Austria – Hungary, France, Germany, Italy, Japan and Russia collectively invaded China. In one sentence he states Shanghai was occupied by foreign countries and the camera conveniently shows a Japanese flag. haha @ the last comment, I found it funny when the camera centred on a Japanese flag too! As Ferguson said, China and those in the west are very very different from each other, thus I don't understand how on earth he's managed to create three episodes talking about how he's somehow been enlightened with the ultimate understanding of China. I found his comparisons, such as the one with Germany pre First World War absolutely ludicrous! If this is an attempt to better understand China then I am disappointed. A large section of Chinese history has been airbrushed in Ferguson’s program. How China was treated by European states within China and on the international stage radicalised generations of young people who repelled and struggled leading to the birth of the Chinese communist party. Ignoring this you just cannot understand how China got to where it is today. I find it amusing that such a famous historian used the phrase ‘airbrushing over history’ numerous times in the program while he was doing the same thing in making it.